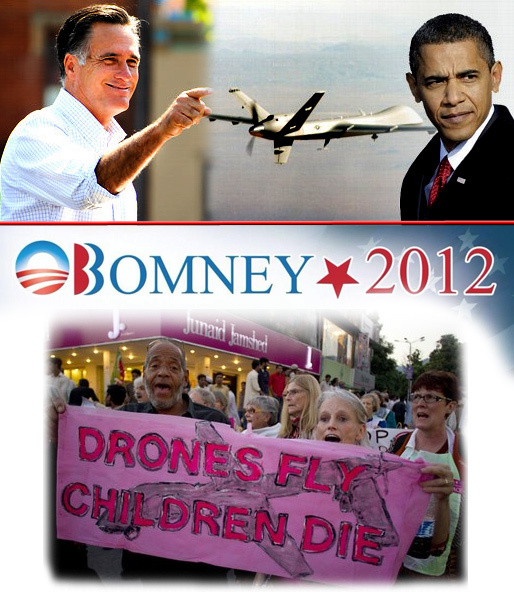 If you oppose drone strikes, that is to say the unmanned aerial military assaults of residential and business areas around the globe as the U.S. government sees fit, you cannot vote for Obomney 2012. On issues like drone warfare, corporate cronyism, inflationary monetary policy via the Fed, the surveillance state, NDAA and PATRIOT, the drug war, and criminalizing whistle blowers, there is no debate between Obama and Romney. The corporate duopoly works extremely hard to scare voters into "defensive voting." Rather than voting for a third party candidate or God forbid attempting to run as one, most Americans are corralled into electing the "least worst." Most informed progressives will cast a disillusioned vote for Obama and most principled conservatives will cast a disillusioned vote for Romney. Neither school of thought really gets what they want while Goldman Sachs and other Wall Street firms get exactly what they paid for.